Today’s letter in the Really Like This Book podcast series script catch-up is T, so it has to be Angela Thirkell. 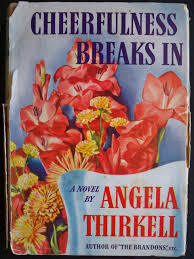 I’ve spent several years writing about Thirkell, so I need to remind myself that although she used to be really famous, now she is hardly known at all, unless you’re in the Angela Thirkell Society in the UK, or the US branch, or have discovered Virago Press’s recent reissue of several of her excellent novels. 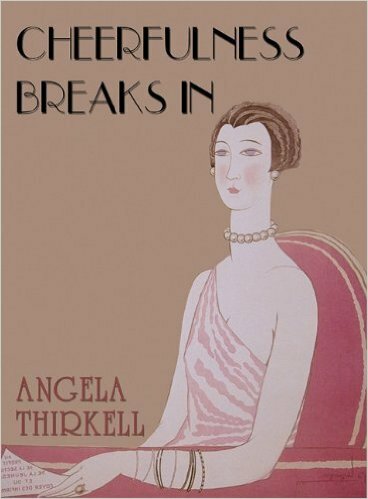 During the Second World War Angela Thirkell was a best-seller, publishing a novel every year for most of her career. This isn’t always a mark of literary quality, but it certainly tells you about her self-discipline, and the demands of her readers, who clamoured for more every year. She began publishing in the early 1930s, and published her last novel in the year before she died, in 1960. She wrote about the same thing for thirty years: the small-town and country lives of a group of upper-class characters and their servants, tenants and neighbours. This sounds pretty dull, but it was the way she wrote that hooked her readers. First, she was very funny. She was a great comic novelist in the sharp-toothed pastoral tradition of Jane Austen. She could be vitriolic: she was described, by a very perceptive American reviewer after the war, as being a good hater (no British reviewer would have dared). Her novels are marinaded in Victorian literature, and she quite clearly loathed the bad manners and slovenly standards of her own day. Most fascinating of all, she uses the fictional landscape invented by the Victorian novelist Anthony Trollope, setting his Barsetshire in the twentieth century. She used his character names, his topographical features, his family histories, and the events of his novels to construct a brilliant parallel universe in which to enact her saga. Her purpose was to satirise modern county life with an affectionate eye, and to be very unpleasant about character types and modern institutions that she could not abide. Thirkell made a virtue of her scatty plotting, and huge cast of recurring characters, but she maintained good control over her stories. She was particularly good at encouraging the reader to feel the excitement of what in another writer’s hands would have been very mundane events. People meet at each others’ houses, to have lunch, or dinner, and sometimes they go to a county event, like a Pig-Breeders’ Association Show, or the church fete. Such were the thrills of English country life before the Second World War. The banality of Thirkell’s subjects might have defeated her ingenuity in time, if it hadn’t been for the war. Most of her novels were aggressively anti- something. Before the war she was anti-Communist, anti-sloppy dressing, anti-rudeness-to-parents, and she ripped apart a set of fondly created character types: the pretentious lady writer, the pompous modern artist, the irritatingly frugal housewife who insists on feeding guests with leftover scraps, the tedious bullying husband who needs to orate at his wife and guests. This could so easily have become too repetitive, even for Thirkell fans, but the war saved her. does this suggest the outbreak of WW2 to you? Me neither. The focus in Cheerfulness Breaks In is the integration of the Hosiers’ Boys School from London – an invented day school for boys from poor backgrounds funded by one of the City of London Guilds – into the private and upper-class Southbridge School, a Barsetshire public school and county institution. The Hosiers’ Boys School has ancestry, and historical status (which is important for Thirkell), but it is also crammed with lower-class boys and, far worse, lower-class teachers. This is where Thirkell is very interesting indeed. The Hosiers’ Boys headmaster, Mr Bissell, is an East End socialist, and struggles to enjoy his first sherry at the Southbridge School headmaster’s house because it is a Capittleist affectation. We see his bewilderment at actually meeting the upper classes in their natural habitat, and at enjoying their food and drink. He also wrestles with completely new ways of thinking, and talking, and indeed conversing at dinner, where the upper-class ladies say what they like to whoever they like, and everyone is polite and friendly above all things. 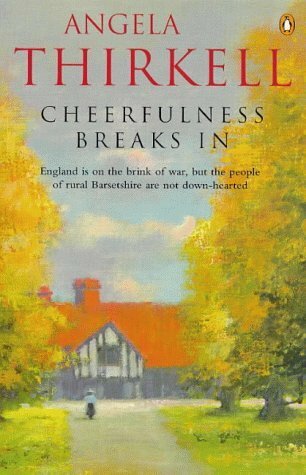 Thirkell simplifies Mr Bissell’s background to caricature, and the effect of this part of the novel is the upper-classes’ revenge against Socialist propaganda, but it surprisingly effective. Class is finally speaking to class, and it isn’t as bad as either might have thought. why did no publisher do a cover with Miss Hampton the radical lesbian novelist on it? When Mrs Bissell arrives, we are plunged into a feminine world where Thirkell really shines. She has already proved in earlier novels how good she is at writing goofy, adolescent, exuberant, eccentric, affected, tiresome, crashingly rude and snobbish women. In this novel she extends her collection to include Miss Hampton, a magnificent lesbian radical novelist in a perfectly tailored suit. There is also Eileen, the impervious blonde stunner serving at the bar of the Red Lion; Mrs Warbury, a vile and ingratiating enemy alien displaying a fine obliviousness to how appallingly she is behaving; Mrs and Miss Phelps, a bouncing Admiral’s wife and her even more bouncing daughter who do good works all day long for the sake of the Navy; Lydia Keith, a thoroughly good girl who has resisted the call to go and nurse like all her friends, to stay at home with her invalid mother and run the farm as well as war relief working parties and the communal canteen for evacuee children’s meals. There is also Thirkell’s own alter ego, the dotty but successful detective novelist Mrs Morland, who sheds hairpins wherever she goes and cannot think in a straight line. Mrs Bissell confounds all local expectations by being a child psychologist as well as a teacher, and is also an expert on tax law for married women. Most unexpectedly of all, she and Mr Bissell become part of the Wiple Terrace set, which seem to spend all their evenings drinking heavily at the Red Lion or at each others’ houses. The Bissells’ joint integration into Southbridge society mirrors the successful and painless integration of the schools, and it also reflects the unsuccessful integration of other incomers into Barsetshire. All the hostesses take evacuee children as a fervent war duty, but hate them because they smell, they are greedy and horrible, they have no manners. The local ladies also resent the evacuees’ parents still in London, whom Thirkell insists are having a holiday from parenting while their children are looked after at other people’s expense. Her facts and history are a bit muddled here, but you don’t read Thirkell for precise details of history, you read her for a general impression written at the time, which is thus a valid piece of contemporary evidence of how one part of the population was feeling about the Home Front. She certainly doesn’t speak for everyone in Britain during the war, or even a majority, but she does speak for her own class, who, oddly, don’t get quite as specific in their disgruntlement as Thirkell does. 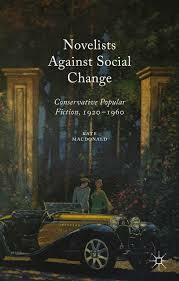 If you want to read about real class resentment, as well as noblesse oblige, read it here. Thank you for this excellent introduction to Thirkell as well as the recommendation — I had dipped into Barsetshire (The Brandons) but was unsure where to go next. It sounds like the wartime novels would be a good place to start. The Brandons is extremely good (what good taste you have), but her first three or four war novels are among her best. I read The Brandons because oddly enough it was the ONLY Barsetshire book my library had! But now if I want to read more I shall have to make more of an effort, so it’s good to know where to focus. Angela Thirkell stands for lots of things I hate and I’m sure she would have disapproved of me, but I love reading her novels, for the wit and social history, as you say, and the continuing creation of Barsetshire. This novel is a particular favourite for Lydia and Noel, of whom I’m very fond. 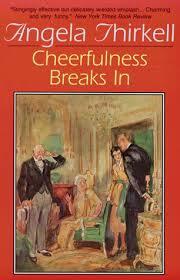 This is one of my favourite books (Thirkell or otherwise). Anything focused on Lydia, my favourite Thirkell creation, always pleases me but the fact that so much of the action revolves around Southbridge – my favourite of Thirkell’s many setting – clinches it. But, much I as love this book, I’m not sure it is one of her best – certainly compared with the books that came immediately before and after it (compared to the post-war books it is brilliant). It has some amazingly funny bits (almost anything related to the changes going on at Southbridge) but I feel like the whole structure of the book is a bit disjointed, with Lydia’s story being crammed in whenever Thirkell felt like a break from Southbridge School, and there are some jingoistic sentiments that just feel so unlike Thirkell (and which vanish from her other wartime novels, presumably once she felt more comfortable expressing her more natural scepticism). Yes, I’d agree with that observation. As if AT was torn between the kind of fiction she was accustomed to producing for an adoring readership, and discovering a new way to write about her subjects in wartime. My comment will be similar to Claire’s. I enjoy pre-war novels (after Wild Strawberries) and the war novels most in the whole output of AT. And I think she is trying her hand in Cheerfulness Breaks In. It seems divided in two unequal parts with the School on one side and “the rest” on the other. It is a disconcerting narrative structure. Nonetheless, it is a very good novel. As to jingoism and conservative ideas, they belong to time and class. It is difficult to apply our own standards to AT’s time and station in life. I see the books more like keys to her world. I have given your link to this entry on my Facebook page and comments are slowly made from people who discover AT and thank you. Potential readership of AT.